It appears as though Google will soon be making the Nexus 5 a bit more customizable, at least, according to the newest leak from Android Police. 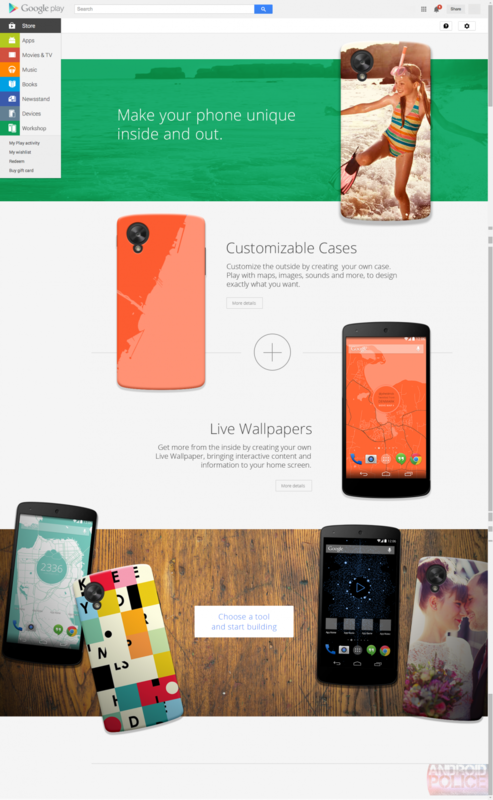 In screenshots reportedly ripped from a dog food version of the Play Store, Google is working on a Workshop, which will allow consumers to create and customize their very own Nexus 5 covers, as well as custom live wallpapers to go along with their exterior theme. As we can see in screenshots taken from Google’s site, there will be many preset options to choose from, as well as the ability to upload your own photos to make a case out of. As of right now, the only option for “customizing” your Nexus 5 is by buying a different color (White, Red, and Black), or purchasing a very expensive mono-color case option from Google Play. Of course, other retailers sell other options. On Google Play, under a new Workshop tab, there will be a few options to help you choose what type of imagery you would like. There is a MapMe tool and a Moments tool. The MapMe tool will allow you to create a case based on a specific location, such as Paris or your hometown. The Moments tool is specifically for uploading your own photos, and then, uploading more photos to create a live wallpaper to go along with your case. There is no current word on pricing or availability, but for some odd reason, we get the feeling that it won’t be cheap, given Google’s history with Nexus accessory pricing. If Workshop does in fact come to fruition, will you be creating a custom case for yourself?